Our last family travel vlog in Bangkok before moving on to Krabi! 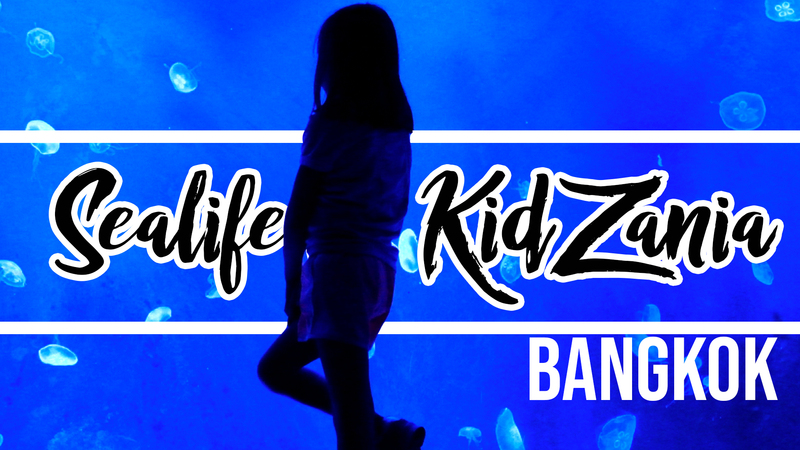 After seeing most the cultural sites in Bangkok our family now has time to visit two of the places high on our family’s list, KidZania and Sea Life, both of which exceeded our expectations! We have had a great time in Bangkok, exploring many of cultural sites, enjoying the food, and most importantly the people. Before we head off to Krabi and get in a bit of beach time, we have a few more things to see, KidZania, Sea Life, and the Ratchada Night Bazaar. All of which are on many many lists of things to see with kids while in Bangkok. There was a bit of confusion at first on my part as Lua said she heard about this great kids museum in Bangkok. She actually described it perfectly but when the day came to go, the actual name of it escaped her. Because of that, I ended up taking us to the Children’s Discovery Center in Bangkok. Let me save you the effort, you don’t need to go here, nearly everything was closed down. It was really a shame as it is a free children’s museum which certainly would be appreciated by most, especially many of the locals who don’t have as much disposable income as the tourists. After another quick search I realized what we were looking for is KidZania. Now KidZania is found on the top floor of a massive mall, the Siam Paragon, it’s easy enough to get to via the Skytrain, I think it may actually be the Skytrain’s largest stop and it is the transfer station to move from one route to the other. The Siam Paragon is unbelievably large, FYI there is a huge food area in the basement with lots of different choices and selections to satisfy anyone’s appetite. There is a dessert place down there called After You Dessert Cafe, which is known for its Honey Toast, which I had never heard of before. There will most likely be a queue, wait in it, it’s worth it. Unfortunately, after taking the long way to the Children’s Discovery Center and traveling over half of Bangkok, we got to KidZania a bit to late as it was going to close in about an hour. It was a bit pricey to be rushed through and the people at ticket sales said you really needed a minimum of 3 to 4 hours, so we decided to come back the next day and figure out something else for the night. In the Siam Paragon, on the bottom floor this time, is also Sea Life, a highly recommended aquarium, that looked like a good way to fill our afternoon and early evening so the day wasn’t a complete bust. My expectations were not high, but I have to say, it was pretty darn great. I can’t believe it was in the bottom of a mall, already a few floors below ground level, there were numerous floors in Sea Life too! It earned a huge thumbs up from the kids and was definitely worth while. The next day we headed off to KidZania, this time not getting lost and having enough time to hit up After You Dessert Cafe for a second round of honey toast. It was a really unique little….theme park? I’m not even really sure what to call it, basically kids take on the roles of adults and can take on jobs to get paid and then use their pay for different service, like getting nails done or food. The kids loved it and it was a great experience for the adults as well, as we have to keep our distance as they go to all the stations, in fact they lock us out to allow the kids to be independent. Being one of our last nights, we knew we wanted to make it to the Ratchada Night Bazaar before we left. I’ve been to may fair share of night markets in Bangkok and many of them are very touristy and have some unsavory, or savory depending on who you are, characters and places of business. It was a great scene, clean, and a nice mix of locals and tourists. I will definitely be back next time in Bangkok. Now we are done with Bangkok. Off to Krabi!